The day has come and Spotify has finally launched in the US. Unfortunately, Spotify will start to roll out free access to its music streaming service via an invite system, so if you don’t have one yet I suggest you head over to the Spotify website and apply. If you applied early and were lucky enough to secure your invite and can now access Spotify, you might be wondering what makes the service unique, what differentiates it from its rivals, or even how to use it. 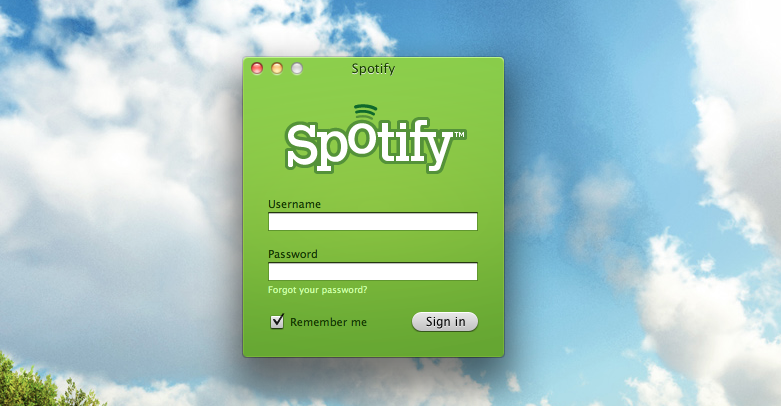 Many of us at The Next Web are based in Europe, so we have had access to Spotify for nearly two years. That means we are perfectly placed to give you the rundown on what makes the service tick. If you want to know the ins and outs of the service, this beginners guide should help you get up and running within minutes. When you receive your invite, you will be taken through the signup process and asked for your personal details. You will also be asked to supply a unique username which will identify you on the service but allow you to generate unique playlists and use the service on your mobile devices. Open (Free) – It will allow you to play local files, share tracks and playlists with friends and stream millions of tracks instantly. Spotify will allow users to stream an unlimited number of tracks for free but invitations to this will be very limited. Unlimited ($4.99 p/m) – The Unlimited subscription removes all advertising and time limits, giving you unmetered access to your music whenever you want it. Premium – ($9.99 p/m) – If you are looking for access to Spotify on any device, to listen at any time, this is the plan for you. Spotify’s Premium subscription gives you unlimited music without advertising to your computer and your mobile phone. The great thing about this subscription is that it provides offline access to your playlists, offers streams at a higher audio bitrate and give you access to exclusive content like early album launches. At launch, users will not be able to download tracks, as European users can now. Many users will choose Spotify Open initially, just to get an idea of how the service operates (after all you don’t want to spend money on something you might not like). Whatever plan you do choose, you will still need to download the same desktop player, which will provide access to 13 million tracks from your computer. Windows and Macs are supported, so grab the client and install it. Once installed, you will need to login to the service using the username and password you specified when you signed up. 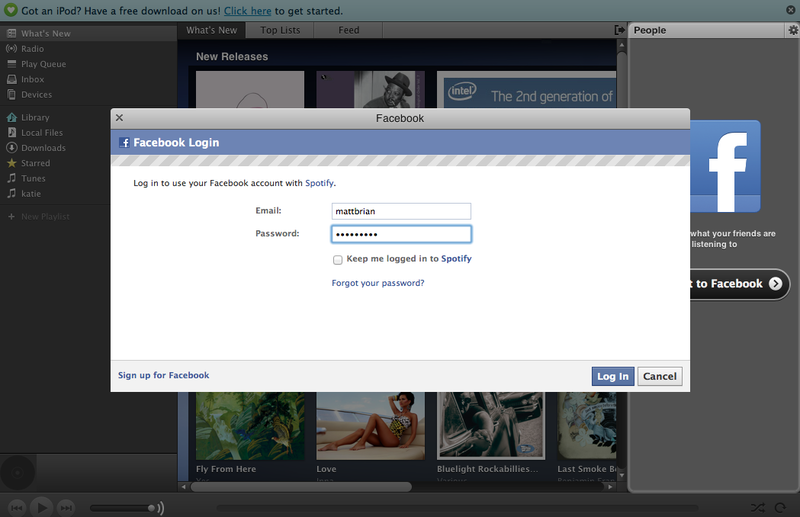 Once you have logged in, you will be presented with an interface that isn’t too dissimilar to Apple’s iTunes software. Spotify employs simple menu and navigation buttons, adding a search box at the top of the screen. Playback controls are located at the bottom. The sidebar on the left has links to the home page, radio, your play queue and playlists. The “What’s New” section suggests new albums for users to listen to, also adding a “Top Lists” section which details the most popular tracks but also albums that Spotify users are either sharing or queuing in their clients. You can see how popular a song is at any time by looking at the Popularity indicator next to every song. Adding music is as simple as searching for the track or the artist using the search bar located at the top of the client. The beauty of Spotify’s extensive catalog is that you will normally see a number of results for the same track that list live, acoustic or remixed versions of that song. Double-clicking starts playing the song but you can also add each track to your play queue or you can add tracks to a playlist. To do one or both, you can right click on the track and select “Queue” or “Add to” where you can specify a playlist to add the track to. The Library is similar to iTunes in that it lists music you have bought but it also includes the music you have starred or added to a playlist. If you come across a track that you can’t get out of your head but you don’t want to add it to a playlist, starring it will ensure it is filed away for you to come back to later, whether it is in the Starred section or in your overall library of music. 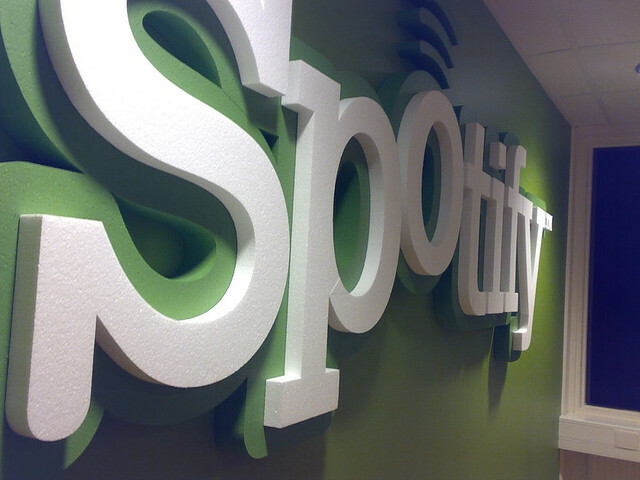 Spotify has baked in some social features to help users share playlists and recommend songs. The company has already confirmed that it will allow US and European customers to use the same playlists, so you will finally be able to share that new Lady Gaga album that you love so much and want everyone to hear. 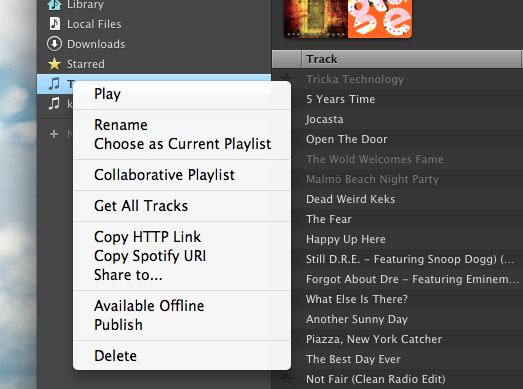 Every playlist you create can be shared by right-clicking it and copying either the HTTP Link or the Spotify URI. The HTTP link will allow you to share the playlist on websites and the Spotify URI will open the Spotify client if the person you share it with has it installed on their system. Once you have joined your Facebook account to your Spotify account, you will immediately be able to see a list of your Facebook friends on Spotify all listed on the right hand side. For each user you click, you will see their playlists in the main body of the client. If you particularly like a certain playlist, you can subscribe to it, adding it to the left sidebar alongside the rest of your own. Once you have done this, that selection of music is now available for you to make available offline if you have a Premium account, meaning you can sync music to your mobile to listen back to it without needing a mobile connection. Adding friends opens the possibility of collaboratively managing playlists. Perfect for an office or a party, you can enable Collaborative Playlists by creating a new playlist, right-clicking and then selecting the option. This playlist can then be shared amongst friends but will also be shown to your friends if they click on your profile from their friends list. Additionally, the URL of a collaborative playlist can be shared publicly, allowing any other user to add to it – help us build The Next Web playlist here. There is also the option to subscribe to thousands of public playlists over at ShareMyPlaylists.com. 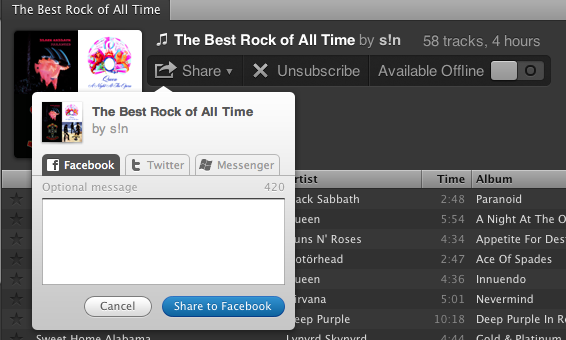 You will also receive a list of recommended songs in your Spotify Inbox. 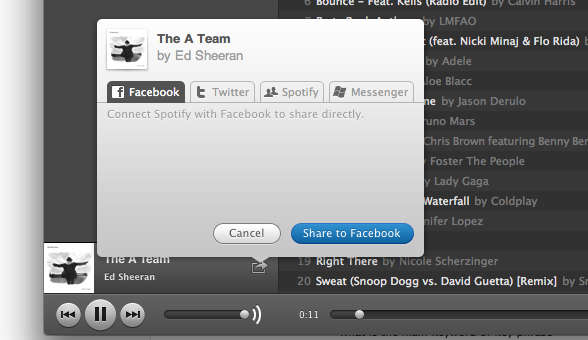 Users who love a track and want to pass it on can use the sharing tool described above and it will land in the recipients inbox instantly. You can also drag tracks from the inbox to your playlists, and also share music with others by dragging it to their username. 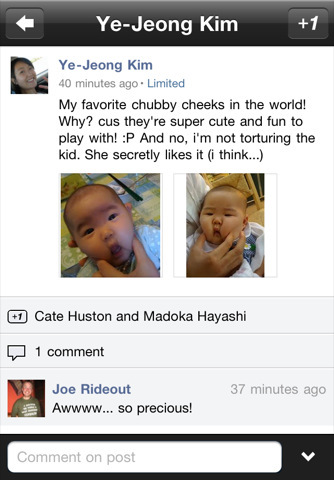 You have complete control over your data and can edit the data you share with your friends at any time. Spotify’s mobile access is seen as its ace card, with many subscribing just so they can take advantage of the service whilst they are on-the-move. Currently, the service is only available on iOS and Android devices but the company is working to release an app for Symbian, Windows Phone and WebOS devices. How you can use Spotify Mobile depends on what account you have. If you have a Premium account, you can enjoy wireless syncing of your Spotify playlists, offline access and the ability to search over 13 million tracks in the Spotify catalog. Streaming works over 3G and WiFi, allowing you to listen to and update playlists on-the-go. Free, Open and Unlimited users will only be able to listen to files they already have on their phone and buy Spotify tracks and add them to your library. Worried that all of that music you bought is now useless? Don’t fret, as Spotify provides a service that will import all of your tracks into the Spotify client to all but replace iTunes as a desktop music player. Clicking the “Local Files” on the left sidebar will index the tracks already on your computer or your iTunes Music Library, list them and make them available for playing. 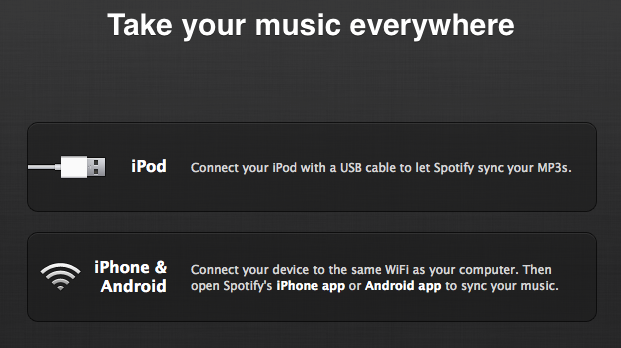 If you want to upload the music to your iPod, Spotify also has the ability to transfer your MP3s to your music device via a USB cable. With a Spotify Premium subscription, you can sync your MP3s from your computer to your phone by just connecting your mobile to the same network as your desktop computer. 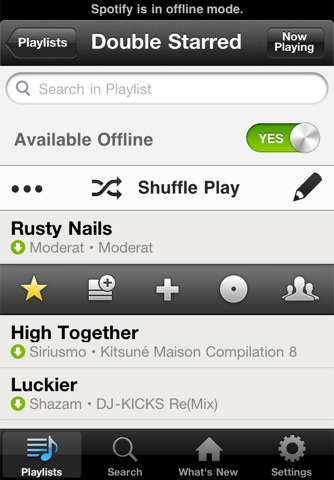 Add MP3s to a Spotify playlist, then open Spotify on your mobile to sync them for offline availability.